The introduction of the Glock Model 38 provides an alternative that bridges the dilemma between the need for a small, easy-to-conceal, lightweight self-defense pistol, which is usually in a smaller caliber, and the need for a bigbore, powerful self-defense gun, which is usually large and hard to conceal. Consumers of self-defense handguns have always suffered on the horns of a dilemma. On the one side is the need for a small, lightweight, easy-to-carry-and-conceal sidearm, and on the other side is the need for a powerful, decisive cartridge. The problem being, if the gun was small and easy to conceal and carry, it was usually offered only in a midbore or smaller caliber. That meant it was less effective than the larger and heavier bigbore alternative. There is now an alternative that meets the needs of both worlds, and it's the Glock Model 38 in .45 GAP. Many have questioned the need for the .45 GAP cartridge, but the truth is, it solves the size-vs.-power dilemma in a new and interesting manner. Like all recent examples of the Glock product line in the mid to large size category, the Glock Model 38 comes with an accessory rail molded into the front, or dustcover portion of the frame. The Model 38 also comes equipped with what has previously been referred to as the "competition" slide-stop lever. The tab on its end offers the user a slightly larger area for the thumb to engage to release the slide. Previously, many thought the introduction of the .40 S&W cartridge more than a decade ago addressed this dilemma, and it did, to a limited degree. There are still many who prefer the maximum bore diameter possible simply because they believe bigger is better. The .40 S&W round is a bigbore cartridge by a widely accepted standard, but even the most obtuse of observers will acknowledge it is the smallest bigbore cartridge available. The big advantage to the .40 S&W round was it enabled platforms formerly built to handle the midbore 9x19mm round to chamber a full-size cartridge and deliver more power to the target. The .45 GAP round takes this process one step further because it enables manufacturers and designers the flexibility of taking handgun designs that were formerly used for midbore calibers of arguably limited effectiveness and pushing them into true bigbore territory. The Glock 38 is a midsize semiauto pistol that corresponds exactly in size to the previously seen Glock 19, the Glock 23 and the Glock 32 semiauto pistols. The test Glock 38 came out of the box with the standard 5.5-pound trigger (it tested heavier in pull weight), standard sights, the new-style extractor and the slide-release lever that was formerly available only on Glock competition pistols. The introduction of the .45 GAP cartridge allowed the Glock engineers to use a handgun design envelope that was formerly used for midbore calibers of arguably limited effectiveness and create a bigbore semiauto with the same overall dimensions and ease of concealment. The basic design of the Glock pistol has remained unchanged since the gun was first introduced in the mid-1980s. There have been improvements and upgrades to individual component parts, but the overall operating design is essentially the same as first introduced and is shared by all Glock models regardless of caliber or overall size. The BATF has classified the Glock as double-action-only in terms of its trigger mechanism, and as I've said in previous articles, I feel this is somewhat of a misnomer. As a review for those who have just joined us, the Glock pistol design is a striker-fired design. When the trigger mechanism is at a position of rest, the striker is partially precocked. The amount and percentage of this precocked condition is open to interpretation, but let's just say for the sake of argument that it is precocked a little less than a third of its travel length. With action of the trigger pull, the striker is cocked the remaining distance of its travel before the striker is released by action of the sear and allowed to engage the primer on the chamber round. All Glock pistols are incapable of recocking the striker if the round in the chamber fails to fire. Therefore, the operator must cycle the slide and chamber a fresh round to recock the striker assembly. This process will eject the dud round from the pistol. (Inset) The magazine for the Glock Model 38 holds eight rounds of .45 GAP ammunition. Finger grooves are molded into the front of the grip section of the polymer Glock Model 38 frame. The Glock Model 38 follows the same size and design criteria as the previously seen Glock 19, Glock 23 and Glock 32. The Glock system has proven extremely popular with law enforcement, military and armed security worldwide. Much of this popularity can be traced to the design's superb reputation for reliability. The relative low number of parts for the Glock design makes it one of the more reliable semiauto handgun designs on the market for the past two decades. The only instance of a malfunction in all of the testing of the sample Glock 38 was one instance in which the slide locked open prematurely on a partially emptied magazine. It happened only once, and I tend to believe my thumb may have become positioned under the enlarged competition-style slide-stop lever and inadvertently engaged it. he frame or the slide. The trigger safety is pretty much self-explanatory. Shooters new to the Glock system should thoroughly understand that keeping their finger out of the triggerguard is the same as engaging a manual safety, and inserting their finger (or any other object) inside the triggerguard is the same as disengaging the manual safety on a traditional semiauto design. The introduction of the .45 GAP cartridge caused many commentators to question the need for this round when it was compared to the traditional .45 ACP cartridge. Initially, the .45 GAP was supposed to be limited to projectiles weighing 200 grains or less by the first ammunition company to load it--Federal/Speer. But shortly after the round's introduction, Winchester found a way to load the traditional 230-grain bullet in the extremely short case of the .45 GAP and still achieve the velocities seen with .45 ACP. Essentially, as loaded by both ammunition firms, the .45 GAP is loaded to the pressure level of a +P .45 ACP. In testing the Glock Model 38, some surprising results were seen when examining the chronograph results. In comparison to the full-size and longer-barreled Glock 37, the Glock 38 fired a couple of the test loads at the same speed or even a wee bit faster. The Lawman 200-grain TMJ load recorded 956 fps from the Glock 37 while the same load from the test Glock 38 ran 980 fps. The Winchester 230-grain loads, both the WinClean BEB load and the Ranger "T" load, ran slightly slower, with the difference being between 20 and 35 fps. But in terms of accuracy, the test Glock 38 clearly preferred the Winchester Ranger "T"; this load consistently shot the smallest groups by a wide margin. Considering the difference in barrel length of the two Glocks, the difference seen in the lower velocity is a small price to pay for the overall reduction in size of the Glock 38. (Left) The front sight is a small vertical blade with a single white dot on its rear face. (Right) The test Glock 38 came equipped with the synthetic blade rear sight that has the white outline surrounding the square-cut U-notch. As far as accuracy was concerned, the Glock 38 performed as expected. All Glocks are reasonably accurate pistols, but due to their unique trigger mechanism, they are not known as superb known-distance target guns. Overall, the accuracy for the sample Glock 38 was slightly above average for a gun of this size and type. The Model 38 comes with a magazine possessing an eight-round capacity. 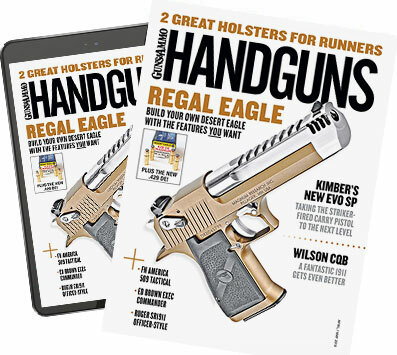 This translates into a medium-size pistol with the same capacity as the traditional full-size 1911 pistol, but it is also lighter in weight because of its polymer construction. Although all Glock designs are slightly thicker than corresponding 1911-style pistols, the overall size of the Glock Model 38 lends itself easily to concealed carry purposes, and its lighter weight makes a much easier burden to transport for long hours. The best way to evaluate whether the Glock 38 fits your particular needs is to first examine the Glock system of operation. Some people plainly don't like the trigger pull one experiences with a Glock design. The sample Glock 38, while equipped with a 5.5-pound trigger (as stated on the end of the shipping box), actually measured closer to 7.5 pounds in pull weight, but it is so hard to judge because it is simply so different from that experienced with any other design. The Glock trigger takes experience to become comfortable with it. As for the caliber and magazine capacity of the Glock 38 when compared to guns like the Glock 19, the Glock 23 or the Glock 32, the best way to assess the Glock 38 is to determine what means more to you: a whole bunch of smaller bullets or a gun offering true bigbore performance. As an old revolver shooter who is quite comfortable with six big bullets, my answer to that question is obvious. The Glock Model 38 is among the first to solve the size-vs.-power dilemma that has historically plagued all concealed carry operators since armed self-defense began. Many will find this new pistol is well worth their time and money.